After 25 years in a top restaurant in Edinburgh, Angelo decided to venture out and start a fresh in a small town called North Berwick. In 2006, Osteria was established and soon became a hit of the town. An “Osteria” in Italy was originally a family run place serving simple food and wine. The menu’s were likely to be short and had great importance on local specialities such as pasta, grilled meat and fish. 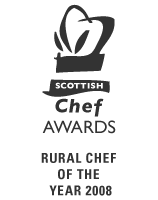 In 2008, this meaning was fulfilled when daughter, Daniela, after gaining experience working along side top chefs, took over the kitchen, becoming head chef. 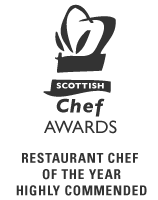 With father and daughter working together, Osteria began picking up many awards such as “Best Rural Chef”, “Best Customer Service” and winning “Best Italian Restaurant in Scotland” several times. 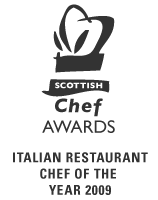 With the family grown, Daniela and her husband Daniele work together to produce unique Italian style dishes, using fresh local produce Scotland has to offer and Angelo out front to keep up the reputation of an excellent fine dining experience. 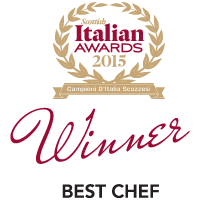 At Osteria, our chefs use fresh and simple ingredients to give our customers the true meaning of Italian cookery. Thanks to our local suppliers, we are able to create our unique Italian style with a twist of Scottish flavours. Our head chef, Daniela, being heavily influenced by her grandmother’s cooking, strongly believes in having everything homemade from start to finish, and this is one of our greatest strengths with our menu, which makes us very proud of our Italian roots. Our wine list has been very carefully thought out by Angelo to give our customers the finest wines from everyday to vintage and prestige. 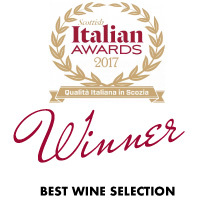 Angelo is also very pleased to be in collaboration with the producer “Mastroberardino”, as his winery and vineyards are from his hometown in the heart of the Campania region. 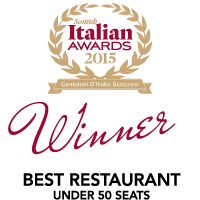 To make a booking at Osteria please call the restaurant directly on 01620 890589. Osteria can not take any bookings from emails as this is for enquiries only. We are open from Monday night to Saturday in the summer season and open Tuesday to Saturday in the winter season. Although Osteria is child friendly, the booking staff must be made aware of any child when making a reservation. Please note that parties of 6 or more will be asked for credit card details at the time of booking for a reservation security. By continuing with making the reservation, you agree to our terms and conditions which are stated below. 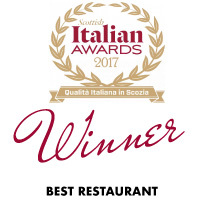 Osteria is a small, independent restaurant and as such, our continued viability relies heavily on reservations being honoured by our guests or sufficient notice being given of any changes to plans or reservations. The team at Osteria reserves the right to cancel your reservation without further notice, if the reservation remains unconfirmed on the day. For all bookings of 6 or more, credit card details is required for security. Osteria reserves the right to charge for any guest cancelling within 48 hours or any No Show guest (lunch £10 per person and dinner £25 per person). Any charges will be taken from the credit card provided at the time of booking without further notice. Small amendments may be made after the booking is confirmed, but additional space cannot be guaranteed. The service charge at Osteria is always at the discretion of our guests. However, please note that a 10% charge is added to all our group bookings of 6 and more. At Osteria, you can enquire about taking over our entire restaurant which can hold up to 32 guests. We can accommodate birthdays, anniversaries or any other special occasion you might have. Our front of house team are here to make you and your guests have a special time and our chefs will put together a menu for you accordingly. Occasionally Osteria hold special events for all our customers to enjoy. Please take a look below at our upcoming events.